Ligament injuries otherwise referred to as sprains are common in everyday life. They are even more common in those who participate in any kind of sporting activity, especially those which involve rapid changes of direction such as football, rugby, hockey, tennis etc. They can significantly limit your ability to participate in the sports and activities of your choice and unless properly managed will commonly reoccur. The staff at Midlothian Physiotherapy LLP in Eskbank just outside Edinburgh, can help assess the nature of the problem and help you return to normal as quickly and as easily as possible. What is a Ligament and how does it get injured? First of all it is important to explain what a ligament is. A ligament is a tough, flexible band of soft tissue which joins bones together, thereby stabilising the joint that they are part of but still allowing enough movement that the joint can perform it’s function. Therefore there is a balance between being tight enough to control and stabilise the joint but not so tight that it does not allow adequate movement. The mechanism of injury is similar to the mechanism of muscle strains, in that the ligament’s capacity to tolerate a given mechanical load is exceeded when the joint is stressed beyond it’s normal range of movement. For example when you land badly on your ankle or if you are tackled playing football or rugby and you twist your knee. This then results in some or all of the fibres that make up the ligament being torn or damaged. As with muscle strains, ligament sprains can be graded on a 3 point scale. Grade 1 sprain: Mild ligament tear, there will be a few fibres torn(less than 10%), some tenderness and swelling. However the joint will not feel unstable or give way during activity, ligament testing will not show any laxity or instability. Grade 2 sprain: Moderate ligament tear, there will more than 10% of the fibres torn however the ligament is still intact. There will be a fair degree of swelling and tenderness directly over the injured ligament. There may be a degree of instability and ligament testing may reveal a degree of instability, however not marked instability. This can be difficult to assess immediately post injury due to the swelling and muscle spasm that is often present. Grade 3 sprain: Complete rupture, as the name suggests the ligament is completely torn and there is no structural integrity. Therefore the ligament will not be able to control movement around the joint, ligament testing will be positive for laxity and the joint may well be unstable, that is giving way in everyday life. Ironically despite the severity of the injury there may be little pain, although there will be marked swelling and tenderness over the affecting ligament. So if you have a Ligament sprain or tear what should you do? As with Muscle tears or strain you shouldn’t do much for the first 24-48 hours except rest, apply ice and compression and keep the affected area elevated as much as possible. Adequate pain relief is important to ensure that you are able to rest and ensure that you are able to optimally rehabilitate the injured ligament and surrounding structures. Obviously if you have any doubt regarding the degree of seriousness of the injury you should seek medical assistance via your GP, A&E or minor injuries unit. In certain cases you may require the use of crutches or devices such as splints or supports to enable you to mobilise safely. Depending on the degree of injury and the level of function you are aiming to return to you may require surgical intervention. However unless you have sustained a grade 3 ligament sprain this is unlikely. 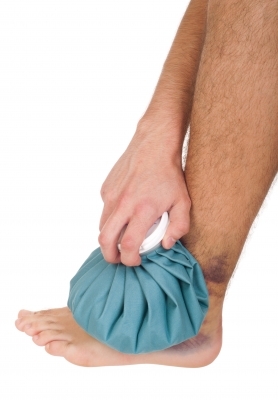 For first hand personal experience of an acute sprained ankle please see this blog post here. Following the initial injury the tissue repair process begins as discussed here in the discussion regarding tissue healing following a muscle tear or strain. Once you have rested, iced, compressed and elevated the injury for the first 24-48 hours it would be appropriate for you to attend physio to optimise your recovery. As with any condition or problem that patients present to our clinic with. Your physiotherapist would take a full history regarding the injury itself, any previous injury or other problems around the area prior to the injury. In addition to asking questions regarding your general health, any relevant family history and your sporting or other interests. Once this has been taken the physio would carry out a physical assessment to make a diagnosis. They would then in discussion with you, plan your rehabilitation and eventual return to whatever level of function that would be appropriate for you and your own goals. If on the basis of the initial assessment the physiotherapist thought you may need surgical input. For example if you had torn your ACL and you were a keen footballer, we would liaise with your GP or surgeon to expedite your recovery. Assuming that your physio feels that surgery is not indicated, you would then start rehabilitation. Initially this would aim to reduce swelling and pain and to restore joint range of movement. Once these goals were achieved you would start a graded exercise programme specific to you to address any deficits in strength, flexibility, balance and control you may have. Other treatment methods such as ultrasound, soft tissue work, acupuncture or manual therapy, would also be used as appropriate. Once these deficits have been addressed, you would then start a graded return to your chosen sport or other activity. If at this point or indeed at any point, you were not progressing appropriately we would discuss this with you and liaise with your GP as appropriate. If you have a ligament sprain or indeed any other injury, please contact us to make an appointment and we’ll do our best to get you on the road to recovery as soon as we can. We can normally see you within a few days and we have appointments from 8 am to 8 pm at our clinic in Eskbank near Edinburgh. So we can see you at a time that is convenient for you. All of our physios have been qualified for at least 15 years and we have experience in both participating in and treating people injured in a wide variety of sports and activities. This entry was posted in Conditions we treat and tagged Ligament sprains. Bookmark the permalink.